Using Every Method Possible to Get to the Top! 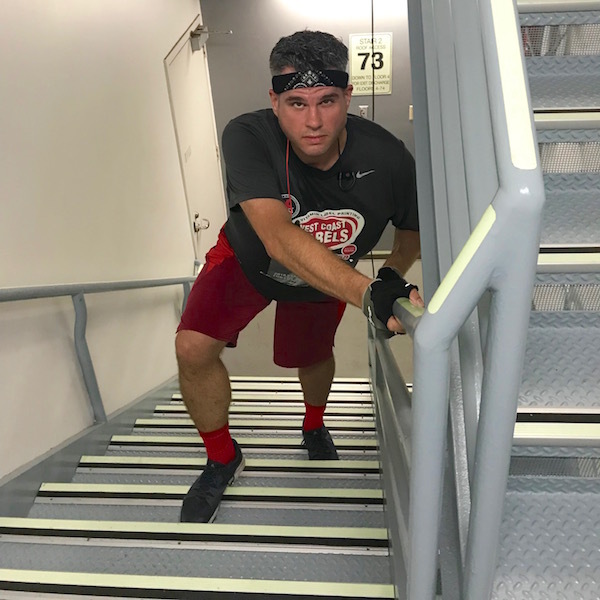 (Stair Climb for Los Angeles 2018 Race Recap) | Keep It Up, David! 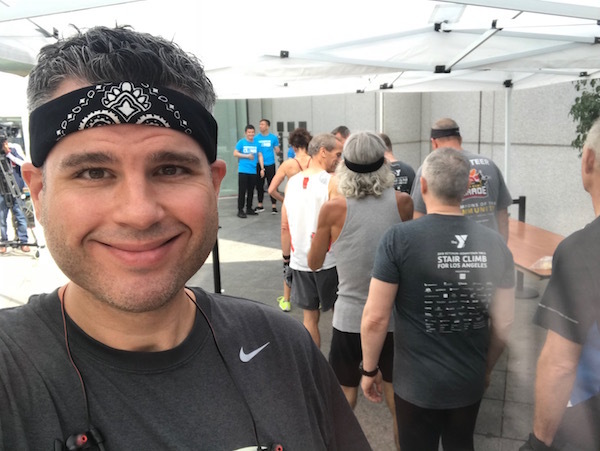 This was my sixth year racing at the Stair Climb for Los Angeles, a fundraiser benefiting the Downtown-Ketchum YMCA, so I knew what to expect: 75 stories (and 1,664 steps) between the start and finish lines, every one of them harder than the last. But I knew I’d only be a few weeks into my training, so I approached this race differently than in years past. In fact, my only goal was to have fun. Setting a personal record wasn’t going to happen – not this year – and I just wanted to enjoy being in a race environment, and remind myself why I love this sport and these events. Not doing the race, due to a lack of fitness, was never an option. I’d rather use these races as an incentive to get back into shape, and not as a reward for being in shape. I arrived on Friday morning with plenty of time. I had qualified for the Elite wave, and was assigned bib #16. Good ol’ lucky number 16! I did a light warm-up and a lot of stretching and purposefully positioned myself near the end of the line. They were letting racers enter one every 15 seconds. One final selfie 30 seconds before go time! I entered the stairwell around 11:25am and guess what? 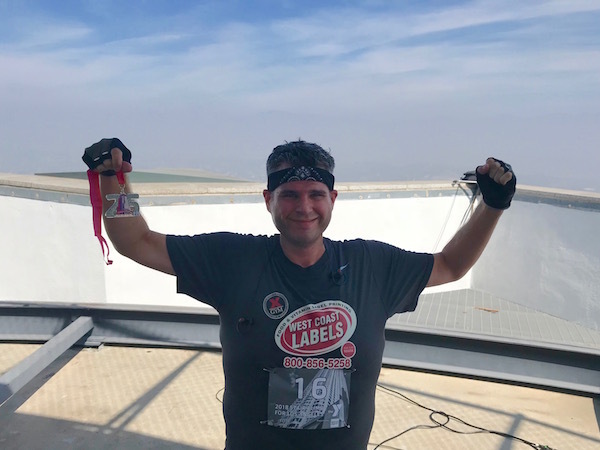 Racing up stairs is HARD, and this race felt ridiculously difficult, and I knew it would. 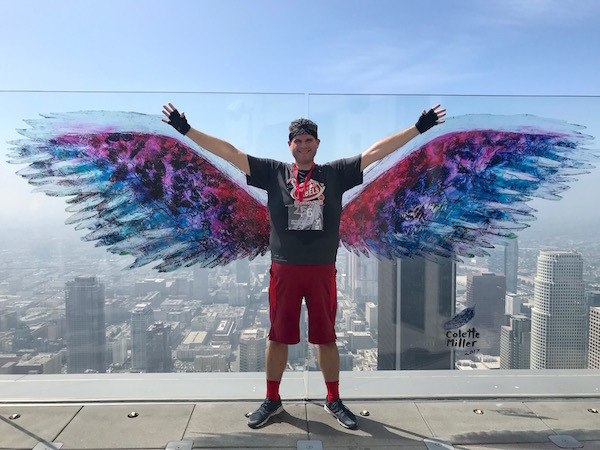 I double-stepped as long as I could, but started switching occasionally to single-step flights around the 12th floor because there was no other way. I really focused on staying positive, because I knew that it would be easy to slip into negative territory. 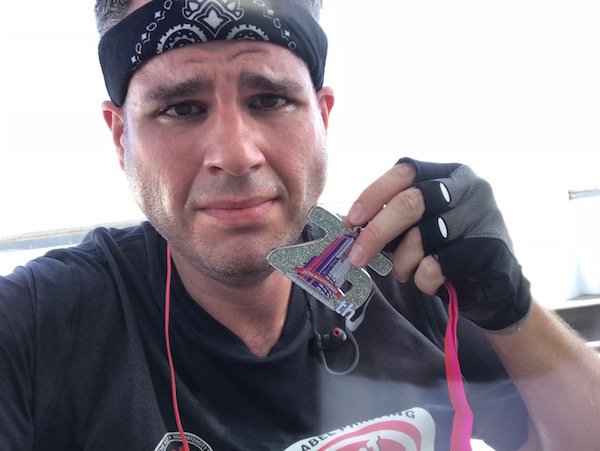 I reminded myself that these races are excruciating even when I’m in peak physical shape, so really this race was not any harder than any of the rest. And I reminded myself that this race would only help me get stronger and better and faster, so there was no reason to not give it my all. 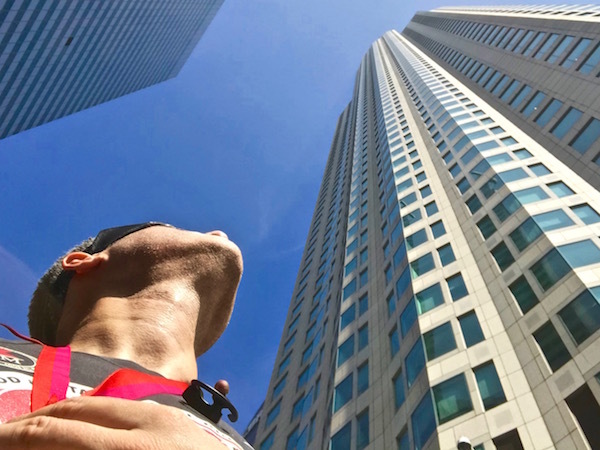 Around the 40th floor, I no longer had to give myself pep talks, because I noticed another racer hot on my heels. By this point I was achy and exhausted, and my lungs and legs were burning, but the sight of another racer a couple flights below fueled my competitive nature. I can’t let this guy pass me. I have to keep my lead. The racer was a buddy named Tom. I don’t know him that well, but we had met at the Tower 2 Tower race in June. Like me, Tom is a Michigander. I had no idea how fast he was, or if maintaining my lead was possible, but I was going to try. After ten floors of keeping him at bay, I knew I had the ability to keep him to keep my lead the rest of the way. And at that point, I was literally scrambling up stairs any way I could. I double-stepped when I could, tried to make efficient turns, and used those handrails to help pull me up. Everything hurt so bad by the 65th floor that I started screaming every so often, which feels so good when every other part of me is in such agony. If Tom wasn’t nipping at my heels, I probably would’ve given into the pain and slowed down, or maybe even paused for a second or two, but I was determined to keep him at bay. 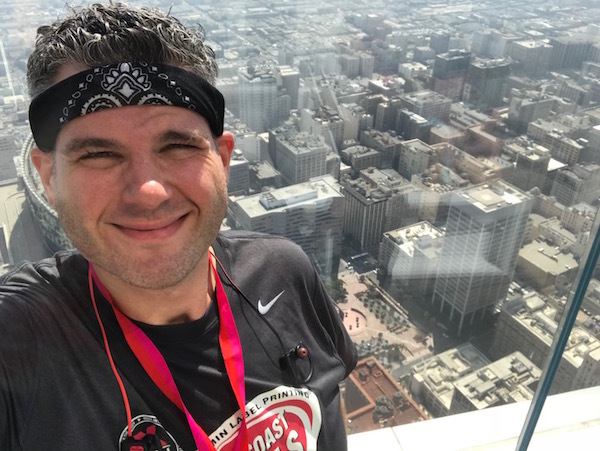 There’s a short jog on the 74th floor, before the two final flights of stairs, and that’s when I saw a volunteer, on the stairs ahead of me, carrying up two folding chairs to the rooftop finish line. I wanted to cry out for him to get out of the way, but I couldn’t make a noise in between breaths. Luckily he saw me and Tom coming, stepped out of the way, and I powered through the final few stairs and across the finish line. Tom followed a few seconds after. I had managed to not let Tom pass me, although he did succeed in narrowing the gap. When I first saw him near the 40th floor, he was two flights (about 20 steps) below me. By the end, he was no more than six or eight steps below. 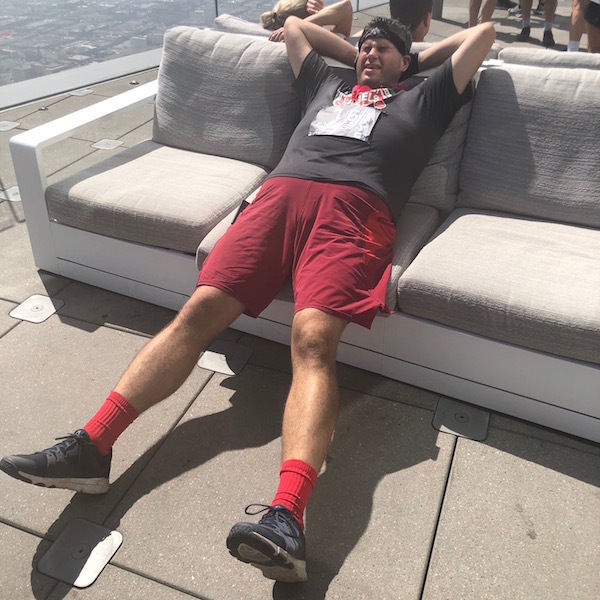 I collapsed on the roof and took a few minutes to catch my breath before collecting my medal and sitting back down again. Normally the view from 1,018 feet up is phenomenal, but that day it was smoggy, foggy, and/or overcast. We couldn’t even see the Hollywood Hills, which aren’t that far away! And thank goodness for big comfy couches! 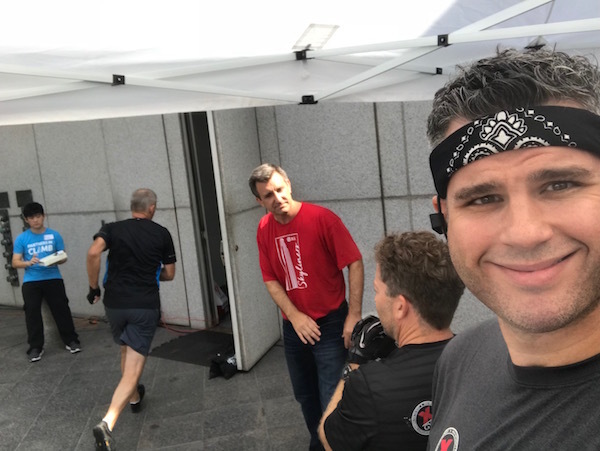 It took a couple hours for the results to start getting posted, and before that could happen, my friend Alberto came over and said “I’m climbing again!” So I joined him, and we headed to the start line. At 12:50, I entered the stairwell again. No timing chip, no pressure. I stepped aside dozens of times to let racers pass. After a cool and casual 27 minutes, I emerged on the roof, and Alberto and I headed back down to the street. At 1:40, I entered the stairwell for the third time. Because why not? Alberto went on to climb a total of six times that day, but I tapped out after three. 225 stories was plenty, and my body was ready to call it a day. I think it was after the second climb that I got my official time for my first climb. 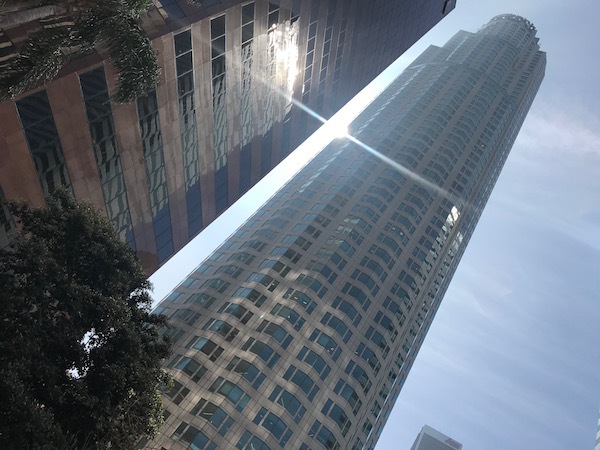 I climbed 75 stories in 20 minutes, 10 seconds! This was a pretty shocking time. I arrived that morning thinking that, due to my lack of fitness, I would likely clock my all-time slowest climb, but that wasn’t the case at all. In fact, of the six years I’ve done this race, this was my fourth fastest time! A successful day, every way I look at it! A big thanks to Steven and Alexis, who made a big contribution to the Downtown-Ketchum YMCA so that I could participate in this race. Thank you for the donation and support! This entry was posted on Sunday, September 30th, 2018 at 3:00 pm and is filed under Uncategorized. You can follow any responses to this entry through the RSS 2.0 feed. You can leave a response, or trackback from your own site. I was hurtin every step of the way right along with ya David! Thanks Karen! Always great to see you. Great job, buddy! For this year only, you’ve done US Bank half as many times as I have. Well isn’t that a great math fun fact! Reading your post makes me want to train to do this kind of race. In the winter I will walk the stairway at my work during my breaks… But that’s only 10 floors or so that I do at the end of my break. Awesome! Ten stories is a great start. Keep it up! 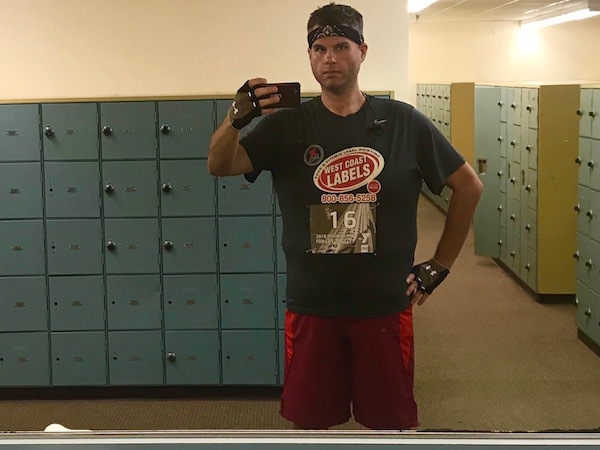 Nice recovery & endurance, David! Some people who’ve never raced might not fully appreciate how edgy it is when you push harder trying to stay ahead of another climber. But that’s just one of many factors that make these events so exciting. And It was cool to see the iconic photo of you on the wave-times page last week when I was checking to see who registered. Thanks George! And I missed the photo on the wave-times page – they just emailed me that info! Did you end up racing? I just checked the SportHive Results page, & noticed they’re using it as a background there too. Will send a screenshot to you by E-mail in case they change the website layout again.